Once I Laughed is a musical showcasing and inspired by the music and the lives of the Andrews Sisters. The Andrews Sisters, famous for their tight 3-part harmonies and tireless commitment to touring for the American military during World War II, were, in their time, the most famous ‘girl group’ in music history. By the 1970s, the group had sold over 75 million records, and hits like “Boogie Woogie Bugle Boy” had solidified the sisters in the minds of Americans forever. 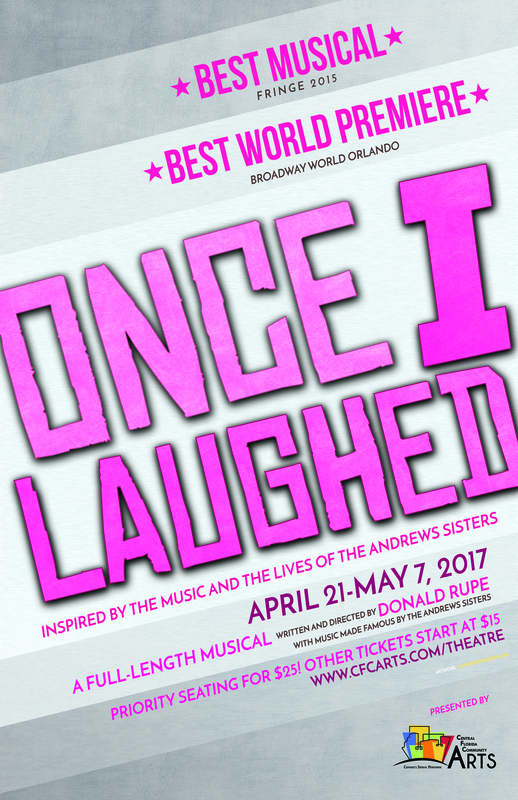 Members of the CFCArts Theatre Program will present Once I Laughed on select dates April 21 – May 7, 2017 at 7:30 pm and/or 3:00pm at the CFCArts Blackbox Theatre, located at Central Florida Community Arts 250 SW Ivanhoe Blvd, Orlando, FL 32804. Seating for all Once I Laughed shows is limited and advanced purchase is strongly recommended. Priority seating can be purchased for $25, guaranteed seating can be purchased in advance for $18 (credit card/Paypal) or, if available, can be purchased for $15 at the door. Tickets for Industry Night are just $12! Doors open 30 minutes before show time and all seating is general admission.